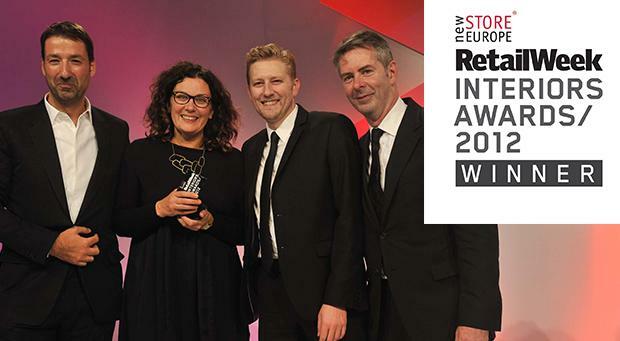 Last night, ‘i-am’ associates proudly received a Retail Week Award for their work on Domus, winning the ‘Non Food Design of The Year’ category. ‘i-am’ had been up against some stiff competition, with eight other retail designs shortlisted for brands including Boots at Westfield Stratford, Harrods Technology Floor, Next Home & Garden and Primark, making the award even more exciting! The award was presented to a delighted ‘I-am’ and Domus team at a glittering ceremony at the Hilton, Park Lane last night. This is a credit to all the hard work of Tanya Fairhurst (Head of 3D) and the rest of the team at ‘i-am’ associates. We also thank the team at Domus, the UK’s leading tile, mosaic and stone brand, for their vision and ambition.